Fat Bruce Lee and I were on our way back to Los Angeles, and we spotted Burger Joint on the concourse of the Virgin Terminal at SFO. Jackpot! The menu promised the following: "...meats that are humanely and sustainably raised on family farms and ranches..........tasty meals made with the best and freshest local ingredients..." That looked promising, so I ordered a 1/3 pound cheeseburger ($9.75) and an order of fries ($3.95). That was about $14 for a burger and fries, but it was the airport, so prices were bound to be jacked up. My cheeseburger was ready to pick up at the counter in about 8 minutes. 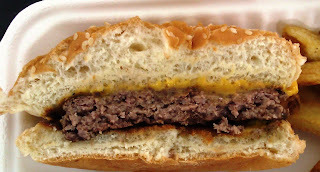 The Beef: The burger patty was the San Francisco-standard pre-ground, 80:20, Niman Ranch Chuck. The patties were firm but not chewy. The flavor was strongly beefy with no hint of aging. The patty was satisfyingly juicy, and it had just a hint of char from the gas-fired grill. The beef was fresh enough, that I caught a little mineral flavor from the blood in the patty. The beef was a better than average at Burger Joint. The Seasoning: The exterior of my burger patty was dusted with an appropriate amount of salt to complement the beefy flavors. The Sear: The burger patty took on a moderate sear from the grill. The 1/3 pound patty was relatively thin, so a proper sear would have been a bit miraculous. The hint of char created an interesting flavor, which generally made up for the lack of a solid sear. The Preparation: The burger patties were freshly formed during morning prep. 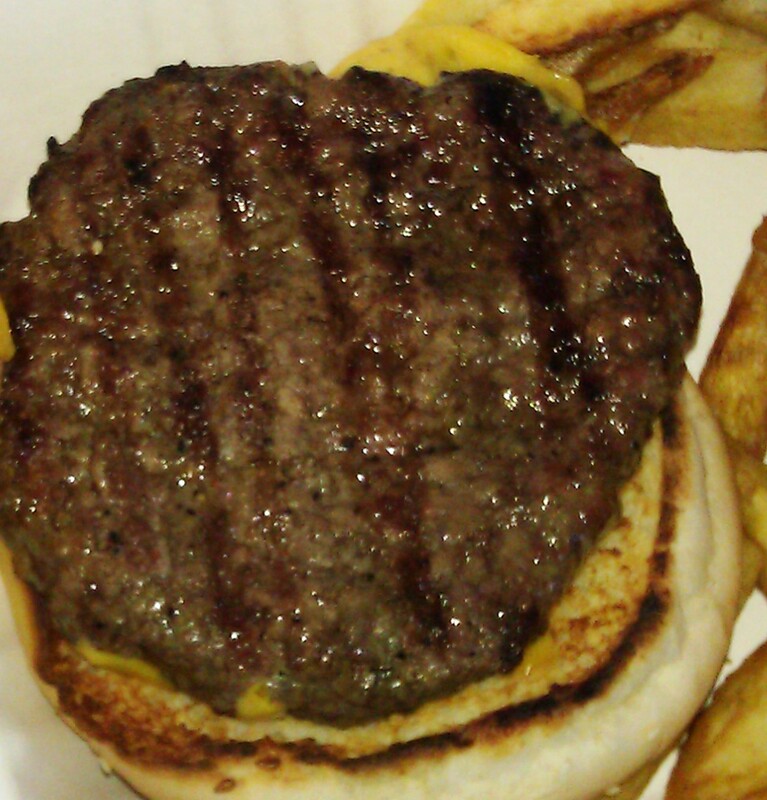 The evenly round patties were pressed, by hand, into molds with a medium pressure. The grind was medium, and my burger was cooked to a juicy Med-Well. The gas-fired grill at Burger Joint's open kitchen was appropriately hot to cook their burgers quickly but without causing too many flare-ups. The Cheese: Burger Joint offered a nice variety of cheeses, but I went with reliable American cheese. This was nicely melted, and it rounded out the flavor profile and mouth feel with the usual umami, salt, and creaminess. The Bun: This was a standard, seeded, white hamburger bun. The bun was nominally toasted, but it offered no crunch. The bun was fresh, moist, yeasty, and barely sweet. The bun stayed out of the way. The Meat To Bun Ratio: This was spot on. The soft bun compressed perfectly. The Toppings: The Romaine lettuce and the tomato slices were fresh and flavorful. The Fries: The thick-cut fries were prepped in-house, and they were cooked in peanut oil. The peel-on fries came out hot, crisp, and golden brown. The fries were not seasoned thoroughly enough, but they did taste strongly of earthy potato flavors. 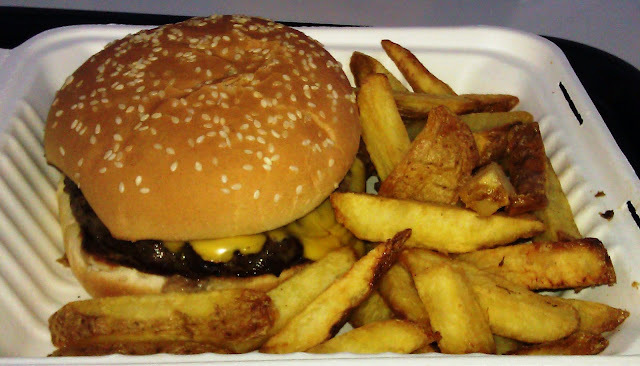 The Value: A cheeseburger and fries at Burger Joint was $14. While this was an airport burger, the value was meager. The patty was a slim 1/3 pound, and the fries were well over-priced. The cheeseburger at Burger Joint was surprisingly good for airport fare. The amount of prep, which occurred on site contributed to the quality of the burger and the sides. I would note that the chicken breast sandwich was bone dry. All told, one could do far worse than Burger Joint. Burger Review : Burger Joint served up one of the best burgers that I have ever tried in an airport. It was pricey but a darn good burger.